There are advantages and disadvantages to every type of commercial roofing system. This article will give you an overview of the most widely used types of roofs so that you can make more informed decisions on your commercial roofing types. Sentry Roofing installs and repairs flat roofs, low-slope roofs, metal retrofit roofs and membrane roofs. The brands we use are Duro-Last, Firestone and GAF. Below is an examination of these commercial roofing types, the materials, and the advantages and disadvantages of each type of roof. 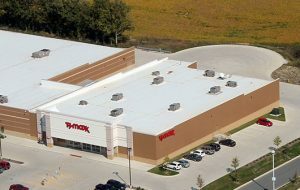 Flat roofs are one of the most common types of roof for commercial buildings. Commercial flat roofs can be significantly more cost effective to build than pitched roofs or steep slope roofs because they require less material due to the fewer square feet to be covered. They are easier and quicker to install, which can translate to a significant savings for the building owner. Owners have many types of flat roofing materials and membranes to choose from – rubber rolled roofing, EPDM, PVC, TPO, bitumen, modified bitumen and built-up roofing. While there are many different color choices to choose from with roofing membranes, however many building owners choose to stick with white. 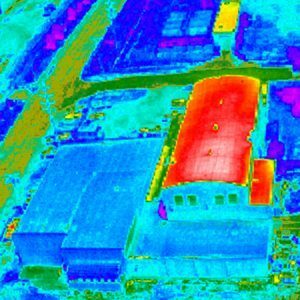 This can help reduce energy waste from cooling costs due to it’s reflective properties. Air conditioners can be moved from the ground to the roof. Solar panels and satellite dishes are easier to install on flat roofs than on pitched ones. These items are then less obvious from the curb or parking lot. Maintenance and drain cleaning is easier on flat roofs since workmen can walk easily and safely, regardless of weather conditions. The most important issue is poor drainage. Standing water can degrade the roofing materials long before they normally would. One of the advantages of pitched roof styled buildings is not having to worry as much about drainage issues. Materials breakdown leads to leaking and water damage inside the building. 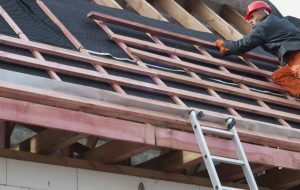 It is imperative that an experienced commercial roofing contractor with a good reputation for professional work do the installation or repairs in order to avoid problems with the roof. 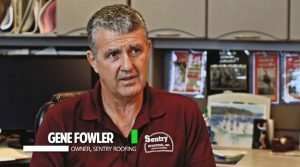 The experienced team at Sentry Roofing understands where the drains must be located and the proper height to avoid puddling. Are you trying to find the best contractor for your commercial roofing project & considering several bids? Low-sloped roofs are often found on factories, warehouses, apartment buildings and other industrial buildings. They may first appear to be flat but they actually have a slight pitch. The pitch of low-sloped roofs allows for water runoff. The roof design directs the water to where it should go, such as valleys, saddles and drains. Roof area is less than with high-pitched roofs, requiring fewer square footage of roofing materials. Low-sloped roofs offer easier and safer conditions for roofers to work on than high-pitched roofs or steep slope roofs. Roof installation, repair and replacement is easier to perform. There is less chance that the building owner will need to call repairmen out to manage water problems, since the slight pitch does not allow for standing water or puddling. Air conditioners, solar panels and satellite dishes are easier to install and maintain on low-sloped commercial roofs than on roofs with a higher pitch. 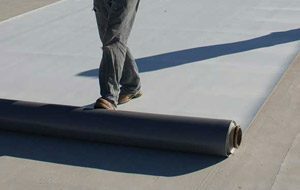 The same variety of materials that are used on commercial flat roofs can be used on low-sloped roofs – rubber rolled roofing, EPDM, TPO, bitumen and modified bitumen. Modified bitumen have longer warranty times due to the additional thickness and superior sealing capabilities. Heavy snows that do not melt quickly can add weight to the roof. Building codes regarding low-sloped roof for your area must be adhered to precisely. While pitched roofs are seen in residential homes more than commercial buildings, they are still commonly used alongside flat and low-sloped rooftops. The main positive aspect of pitched roofs is that the increased slope provides greater runoff for water and snow. The steeper the roof structure, the easier it is for liquid and debris to roll off. Ultimately this means less risk for water buildup that could lead to leaks and mold damage. Overall, having a steep-sloped roof could reduce the amount of repair and maintenance costs from a flatter, less inclined roof. Unfortunately, with the steep incline of a pitched roof it is significantly more difficult to perform maintenance and repair. The need for increased safety procedures, transferring materials and difficulty maneuvering around the roof generally increases the costs of each individual installation, repair or maintenance service. Metal retrofit roofing is a simple, cost-effective method of re-roofing your older, end-of-life metal roof with a durable membrane. The biggest advantage is the cost of the retrofitting your metal roof. This material not only greatly extends the life of your roof, it doesn’t cost as much as your standard metal roof replacement. During installation, the original metal roof provides protection to your building’s interior so you can continue day-to-day operations while the work is being done. This protects your employees, your inventory, and doesn’t interrupt production. Retrofitting is also eco-friendly. By not taking the roof apart and damaging / scrapping the materials, this reduces landfill waste, making re-roofing an appealing option for the environmentally-conscious. When you retrofit over a metal roof, you are taking advantage of reusing your current roof insulation, as well as additional insulation from the membrane. This can help save on energy costs and keep building temperature regulated. While having a metal retrofit roof installed over your existing metal roof can extend the life of your roof by up to 20 years, a complete metal roof installation is generally estimated to last between 30 – 60 years. Keep in mind that comes at a significant cost increase, and can be more cost-effective to simply retrofit. Learn more about repairing or replacing your current metal roofing system with a durable metal retrofit system. Polyvinyl chloride (PVC) is one of the most popular and time-tested membrane material used in roofing today. Sentry Roofing only uses premium Duro-Last PVC membranes. By far one of the largest advantages of PVC roofing materials would be it’s durability, longevity, and fire retardant properties. This membrane has been flame tested alongside other similar membranes with very surprising outcomes. While a TPO and EPDM membrane can continue to burn, spread and melt the material, the Duro-Last PVC membrane will work to self-extinguish the flames. This is incredibly important for your rooftop should any fires occur. Instead of huge areas of membrane melting away during a rooftop fire like with other membrane materials, PVC works to help self-extinguish the flames. This ultimately leaves you with more roofing membrane left and less to have to replace or repair. In addition to great fire resistance properties, PVC is also resistant to moisture, wind and chemicals as well as being tear and puncture resistant. Due to the light colored membrane sheets and thicker insulation, it is also highly energy efficient. Reduce costs on your heating and cooling bills and avoid a heat island effect if you live in hotter areas. The only real downside that might be considered for some building owners is the slightly higher up-front cost of PVC roofing compared to TPO or EPDM. However this is a small price to pay for the durability, longevity, energy efficiency, warranty and fire resistance that PVC has. 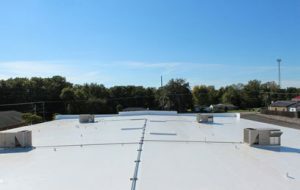 Thermoplastic polyolefin (TPO) is a newer style of commercial roofing membrane. First used as a roofing material in 1986, it is praised for being an affordable, cost-effective alternative to PVC. Today, TPO is one of the most common single-ply roofing material used with sales growing at a double-digit rate year over year. Many building owners have chose TPO materials over other options due to a cheaper up-front cost compared to other materials. 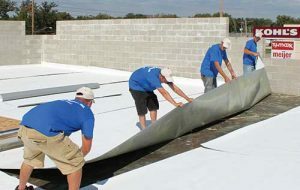 Thermoplastic polyolefin has been compared to PVC and EPDM roofing materials a lot due to similar properties they share. TPO membranes are very durable and flexible, which makes custom edge-to-edge fabrication simpler, cheaper and more efficient. The flexibility helps the material stretch and adapt to your building’s movement and setting. The material is also 100% recyclable and eco-friendly which is great for companies trying to go green. The membrane is slick and good for moving water off the roof. Its lightweight property puts less stress on the building structure than does metal roofing. 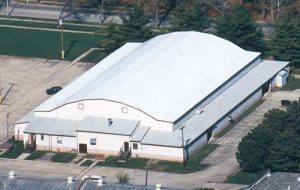 The flexibility of membrane roofing materials allows commercial roofing contractors to mold the material to unique roof designs. TPO membrane’s light color is good for reflecting heat away from the building. TPO membrane comes in white, tan, gray, green, red and blue. This material uses a hot-air gun to seal the seams. One of the biggest downsides to using TPO is that it simply hasn’t been used for roofing as long as other materials. For that reason, some people question the longevity compared to PVC or EPDM roofs. EPDM stands for ethylene propylene diene methylene. This is a durable, darker synthetic rubber material primarily used in flat and low-sloped roofs nationwide. While most EPDM rubber roofs are black, it can also come in a white coating which will help with reflecting the suns heat off of the rooftop. Due to it’s rubber properties, it is able to easily stretch and form-fit to any roof. 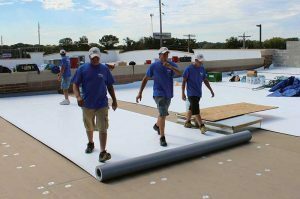 EPDM roofing membrane has been on the market for over 60 years and has a good track record as a commercial roofing material. Due to it’s darker color, it is a good choice for cooler climates. It’s highly durable rubber provides excellent protection from the weather. Seams are closed with adhesives or seam tape. Since the membrane does not have its own insulation, the building owner has several insulation options to choose from. Hot weather can cause the membrane to shrink, causing tear which lead to water getting under the membrane. Adhesives and seam tape can degrade from UV sunlight, allowing water to flow under the membrane. Proper installation, maintenance and repair procedures are necessary to keep the membrane lasting longer. Flat Roofs – More cost effective, quicker and easier to install. Materials include rubber rolls, EPDM, PVC, TPO, bitumen, and modified bitumen. However flat roofs are more prone to standing water and material degradation. Low Sloped Roofs – Allows for better water runoff which means less maintenance calls. Safer and cheaper than pitched roofs and can use the same materials. Heavy snows can weigh down and potentially cause damage. Pitched Roofs – Best for water and snow runoff, but most dangerous for roofing crews. Costlier maintenance and repair costs. Metal Retrofit Roofs – Simple, cost-effective method of re-roofing a metal roof with a membrane system. Reuses your current roof structure and insulation making it environmentally friendly and structurally sound. Can greatly extend the life of a damaged roof. PVC Membrane Roofs – The most popular and time-tested roofing material available. Duro-Last PVC roofing membranes are more durable, fire resistant and puncture resistant than most other available membranes. TPO Membrane Roofs – Light color, good for reflecting heat away from the building. Colors come in white, tan, gray, green, red, and blue. Seams are sealed with hot-air gun. However, easier to puncture and prone to shrinkage. 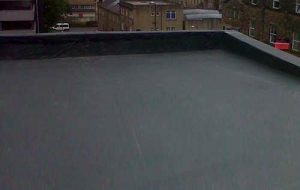 EPDM Membrane Roofs – Darker roofs, better suited for cooler climates. Made of a highly durable rubber providing protection from the weather. Seams are sealed with adhesives / seam tape. Also prone to holes and shrinkage. Still need help deciding the right type of roofing system for your building? Contact our knowledgeable team for a no cost, no obligation rooftop evaluation.